Announced on the official Hulu blog earlier today, the company launched a redesigned user interface that includes an upgrade to the size of the video player. Increasing the native size of the player by 55 percent, the new video player covers a majority of the screen on most monitors. While users with poor Internet connections while likely see more pixelation in the image when watching a 288p version of the video, users watching the 720p HD version of most newly released videos will find the new video player size useful. Regarding the design, Hulu uses a drop shadow to make the video appear as if it was hovering off the layout. Hulu has also removed the screen dimming option from the interface in favor of a dark gray matte that’s underneath the video player. The previous design used a white background to surround the player. The new interface moves the small banner ad placement underneath the video screen in addition to the name of the episode, network, title and other extraneous information. Details regarding the description of the video can be viewed by clicking an arrow icon underneath the video. To the right of the arrow, Hulu users will find the sharing options to share the video on Twitter, Facebook or through email. 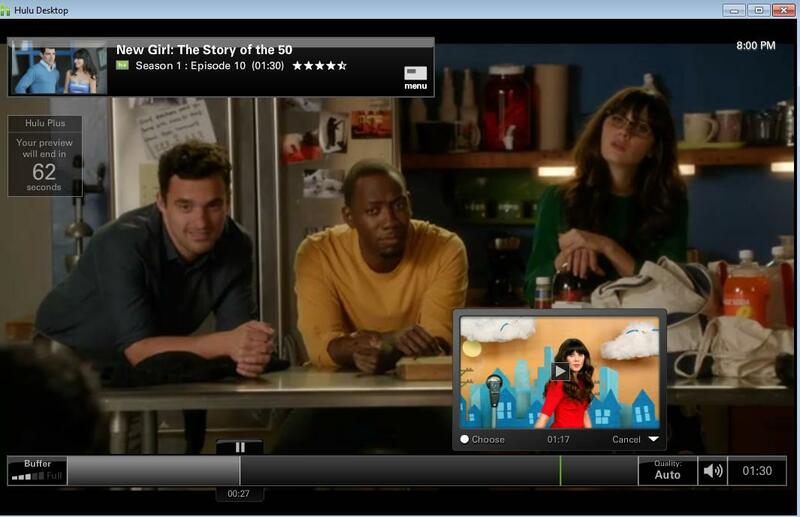 Hulu has also brought more attention to the Face Match feature launched at the end of 2011. Included within the video settings option when playing a television show or movie, users can enable or disable Face Match during the video. When Face Match is enabled, the user can use the mouse to hover over an actor’s face in order to learn more information about that person. 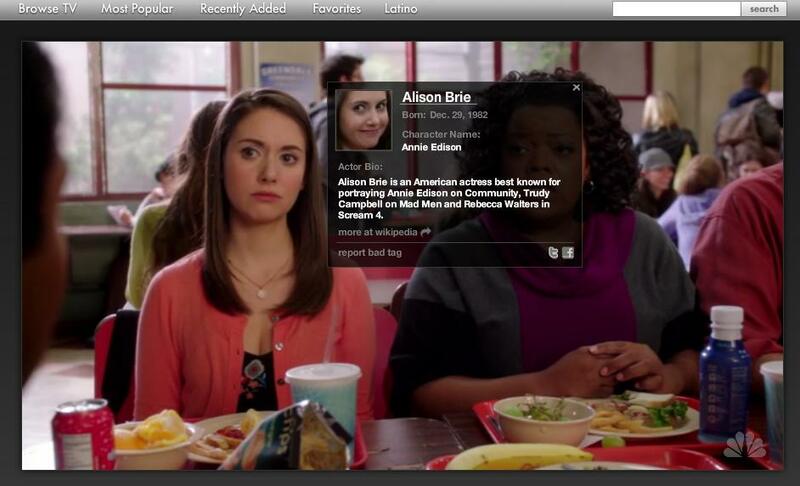 For instance, using the mouse to hover over Alison Brie’s face during an episode of Community will bring up her birthday, her character’s name on Community, a brief bio of Alison as well as links to her Wikipedia page, Facebook page and Twitter feed. 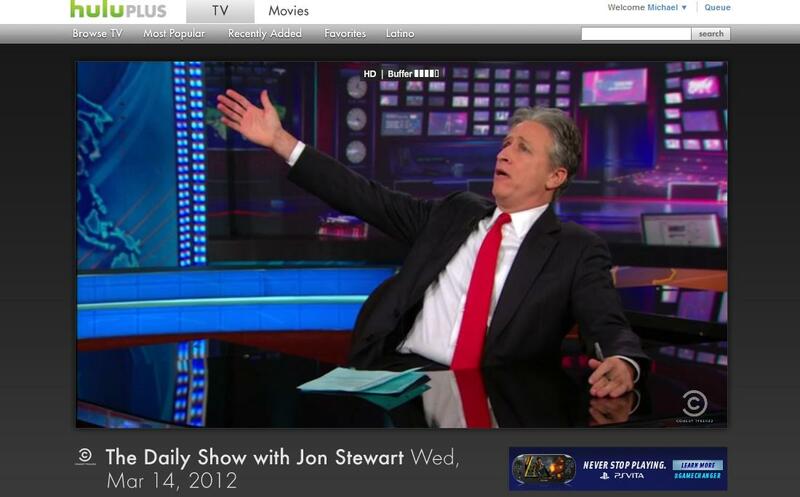 This allows the Hulu user to quickly find the social feeds of any actor or actress. Other projects within Hulu Labs include a caption search that allows the user to search for specific quotes and match them up to episodes of shows, a time-based browsing option to view shows by the air date, social connectivity and a recommendations system for users based off voting. Hulu Desktop is also included within the Labs projects and is popular among people that want to avoid the Web version of Hulu. Offering a streamlined way to browse through videos and avoid too much information, the user interface is designed to work with Windows Media Center and all browsing can be conducted with a remote if watching on a HTPC. While Hulu continues to revise the user interface of the Web version, Greg Kumparak of PandoDaily called out rival service Netflix yesterday for failing to improve the user interface on several platforms. Some of his complaints included spoiler-filled screenshot art on the Xbox 360, an annoying menu prompt on the PlayStation 3, the lack of episode descriptions on the iPhone and Android applications in addition to the side-scrolling interface that appears on the Web interface.